An island paradise in Asia, Bali is hands down the most popular of the 17,000 islands comprising the Indonesian archipelago. It welcomes about 3 million visitors annually who come to Bali to experience a number of activities, enjoy its pristine beaches, visit ancient temples, learn more about its culture in quaint villages, and be completely awed by a number of natural landmarks. Bali is the kind of destination that provides what we consider to be the perfect balance of activities and things to do; here you can either enjoy vibrant days and nights, or quiet time away from the crowds that come with such a popular destination. The best thing about Bali is that it caters to all types of travelers: solo travelers and backpackers meet kindred spirits in its many hostels, budget-conscious travelers explore one of the most beautiful places in the world on the cheap, and the high end travelers experience an elevated level of luxury and pampering. Simply put, Bali certainly isn’t overrated, and it should definitely be on the top of your bucket list. In our quick guide to visiting Bali, we’ve compiled the most common questions we get about visiting Bali, as well as our favorite things to do on the island and top tips. The weather in Bali is a conversation we often have with our clients, because it can get a bit confusing. Here’s the best advice we can offer on when to visit and what to expect- but do keep in mind, there’s not necessarily a “bad” time to visit, it just depends on your comfort with having a few heavy rain downpours during your visit. There are two types of seasons in Bali: the dry and the wet seasons, the latter being usually from October to March. Although heavy rain downpours are expected during these months, there are times when it feels like summer with high humidity and sunny days. The nights are a little bit cooler, especially if you stay along the coast, but they allow for enjoying the cool breeze coming from the sea. The peak season in Bali is during the months of August through September. Holidays such as Christmas, New Year, Easter week, and Chinese New Year are considered peak season, too. Accommodation is quite expensive at this time, but you can expect great weather! The best time to visit Bali is during the dry season, from April to September. This is the time of the year where you can enjoy a number of activities in Bali without having to worry about rain. High season ends in September, making deals even more affordable, but it would really depend on your interests. In any case, Bali is a year-round destination. Honeymooners will enjoy the romantic atmosphere Bali provides. You can spend your days enjoying a number of activities, and your nights just the two of you, enjoying a romantic dinner. There are a number of hotels and resorts that offer the ultimate honeymoon experience. There are so many things you can appreciate on the island when traveling alone. including peaceful walks in its quaint villages, hitting its the beach, enjoying soothing massages and treatments and the company of travelers from all over the world. A group of girlfriends will love what Bali has to offer. You can enjoy a number of water and outdoor activities, party all night with travelers from around the world, explore temples, visits to villages, and perhaps have tattoos done together. Build wonderful memories in Bali with your partner. You can go on a romantic stroll at Campuhan Ridge Walk, enjoy a cooking class together, dine in seclusion on a secret cave at Samabe, and enjoy a swim, surrounded by a spectacular rainforest. Bond with the family while enjoying activities that will make you feel like a kid again. The entire family will enjoy visiting the Big Tree Farms Bamboo Chocolate Factory, experience adrenaline-filled activities at the Bali Treetop Adventures, have fun at the Waterbom Bali, and of course, enjoy a number of watersports activities. Majority of the locals are Hindu, as such, you must respect their religious customs and traditions. Avoid wearing skimpy or revealing outfits when visiting the town proper but do dress for comfort. If you plan to visit religious sites, make sure you are wearing dark colored sarong or long clothing . In addition, women who have their monthly period must not enter any temple. There is no norm when it comes to tipping in Bali. In major hotels and restaurants a service charge is automatically added to your bill but it doesn’t mean you can’t give a tip if you enjoyed the service or if you requested something that needed more effort. In restaurants outside the hotel or resort, you can leave your change or add 5% to 10% to your total charge. It will really depend on your budget and interests. If you just want to hit the beach, enjoy watersports activities,and partying, a week to ten days is enough. If you would like to venture out to the countryside, explore the outdoors, aside from activities mentioned above, two weeks would be the ideal duration. There are a number of car rental companies in Bali so it is easy to rent one. Ideally, it is a good idea to rent a car as it provides you flexibility especially if you want to explore the surrounding areas, but you will have to prepare yourself for traffic and motorcycles that weave in and out especially in the major tourist towns. The roads are quite narrow so you will have to contend with all sorts of vehicles, oncoming traffic as well as a lot of pedestrians. Parking can be a problem too. Average price for renting a car ranges from $15-25 per day. In addition, most cars in Bali are manual transmission. It might be a little more expensive to rent a car with a driver but it is worth it. Price ranges from US$38 to US$150 per day depending on the type of car. The best thing about having a driver is that you are not as stressed out compared to self-driving. Make sure that your driver is a licensed tour guide and rent a car from a legitimate company. You can ask your driver to bring you to a number of places or he can do the planning for you. If you are traveling on a budget and staying for a week or two, renting a motorbike is the best way to explore Bali. It provides you the mobility and flexibility you need to maximize your stay in Bali. You will need an international driver’s license, if you do not have one, you will have to get a local license from the police station. If you are a novice or haven’t driven a motorcycle for ages, this might not be the mode of transportation for you. It requires a lot of skills to drive a motorbike in Bali . and it can be stressful considering how chaotic the traffic is in major tourist centers. It is also better if you rent a motorbike through your hotel so you are assured that the motorbike company is legitimate. You can rent a motorbike for a minimum of US$5 a day. Taking a taxi especially in South Bali is not a problem. It works the same way like other countries, and all you have to do is hail one and tell the driver where you want to go. Be wary of taxi drivers who do not use the meter because they might overcharge you for the trip. Bluebird taxis have a good reputation and they have an app you can download and register at, so you can request for a Bluebird taxi anytime. Uber and Grab provide taxi services too. Flag-down rate is about 50 cents and 25 cents for every kilometer depending on the exchange rate. Bali is a paradise for surfers, and the peak surfing season runs from May through September. The best surfing spots are Canggu, Keramas, Uluwatu and the beaches in Bukit Peninsula. There is no so-called fishing season in Bali. You can fish all year round unless you want to fish for a certain type of fish which are seasonal. There are a number of boat companies that offer fishing tours all over Bali. Bali is one of the best places to go diving. It has three scuba diving zones: South Bali, East coast Bali, and North west coast Bali. There are a number of diving schools where you can learn how to dive, and can also bring you to the best diving spots in Bali. Bali is known for its rich fish and marine life, and the calm waters of a number of beaches provide the perfect opportunity for snorkeling. The beaches in Amed are known for its snorkeling spots, as well as the beaches in Nusa Dua and the islands of Menjangan, Pemuteran, and Nusa Lembongan. If you are tired of hitting the beach, you can actually go Whitewater rafting in Bali. Outdoor adventure companies offer Whitewater rafting on Ayung River, and Telaga Waja. Enjoy a different perspective of the island when you paraglide in Bali. The best times to go paragliding in Bali is during the months of August and September when the southerly trade winds coming off the Indian Ocean provide ideal wind conditions. There are a number of cooking schools in Bali where you are provided the opportunity to visit a local market, buy your ingredients, whip up your own dish, and savor it! Our favorite cooking schools include the following: Anika Cooking Class, Bumbu Bali. Bali Asli, Casa Luna, and Warung Eni. The best way to explore the countryside and meet the locals is to go Village Tracking. The Mayong Village Trekking will bring you to Balinese villages, rice paddies, cocoa plantations, and forests. It will require a lot of walking (about 4 hours) but it is worth it. One of the things you must do in Bali is to visit a number of temples. Bali is dotted with temples that exemplifies the spiritual life of the Balinese people. You must not miss visiting the following temples: Besaki, Luhur Uluwatu, Tanah Lot, Goa Lawah, Danu Batur, Taman Ayun, Gunung Kawi, Tirta Empul, and Danu Bratan. The rice terraces in Bali are not only beautiful sights to behold, these are vast rice paddies that are farmed by the locals. The rice terraces look like a staircase of green, There are two famous rice terraces in Bali, namely: Jatiluwih Rice Terraces, and Tegalalang Rice Terraces. This activity must be a part of your itinerary in Bali. 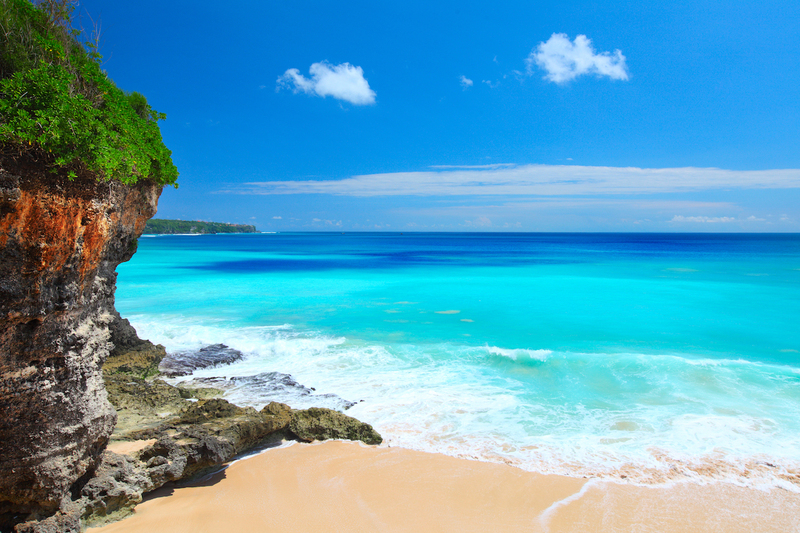 There are a number of islands located off the coast of Bali including Nusa Lembongan, Nusa Ceningan, Serangan, and Nusa Penida. These islands boasts of fantastic beaches and dramatic landscapes. Prepare your hiking shoes when you visit Bali. The island has a number of hiking trails that caters to all types of hikers. Mount Agung located in East Bali is a popular hiking spot. You ,must be physically fit and mentally tough to enjoy the hike. Tired of the beach? Go waterfall chasing in Bali. The island has a number of waterfalls where you can enjoy this fun activity including Tegenungan, Nungnung, Twin Falls, Alingaling, and Sekumpul. — An Indonesian Staple, Mie Goreng is a delicious fare of fried noodles served with vegetables, and your choice of meat. The dish has a lot of variations, and you can add your favorite topping such as fried egg or prawn crackers. — Sate is probably the answer of Bali to barbeque. Mashed chicken is blended with a variety of spices and skewered. Some people prefer fish sate. — One of the most famous dishes in Bali is Babi Guling or suckling pig. The pork is rubbed with an array of herbs and spices, and roasted over a spit. — Bebek Betutu is a unique dish that must be savored. It is actually a smoked duck rubbed and stuffed with a variety of herbs and spices. It takes about 12 hours to cook this dish. — Gado-Gado is a vegetable salad smothered with peanut sauce. The vegetables usually used are spinach, boiled long beans, potato, bean sprouts and corn. Eggs and tofu are added too. — Kopi Bali a local coffee brew will probably be your favorite drink in Bali. It has a very rich flavor and best savored while it’s piping hot. It is not surprising that Bali’s coffee is one of the best as Indonesia is the world’s third largest coffee exporter. Don’t forget to bring home some coffee beans. — Usually served black with lots of sugar, Teh Panas is a refreshing local tea. You can add some ginger for a zesty flavor. — A distilled liquor often called the “rum of Indonesia”, Arak is made from a variety of ingredients but in Bali, it is made from sugar cane. Although it plays an important role in Balinese society.,you must only drink Arak bought at reputable resorts and bars. There has been a spate of poisoning caused by the wrong process of brewing Arak may cause methanol poisoning. Be careful but do try it at least once. — The most popular beer in Indonesia, Bintang tastes somewhat like Heineken beer. It contains about 4.7% alcohol but if you prefer a milder version, you can buy Bintang Zero which has less than 1% alcohol. — One of the most refreshing non-alcoholic drinks in Bali, Kopyor comes from mutated coconuts, and is much sweeter than the average coconut.. The meat of the coconut is spongier and floats in its juice, instead of being attached to the inside shell of the coconut.